"Jefa Greenaway explores how expressions of identity can be facilitated through architecture and design. Lilly Brown is interested in knowledge production and dissemination, while Kimberley Moulton says curating helps her peel back the concrete foundations we walk on – revealing histories and inspiring new cultural visions. Hosted by Benson Saulo – an impassioned youth advocate whose work encourages empowered choice and a trust in inherited knowledge." In this talk presented by Eugene Lang College of Liberal Arts (http://www.newschool.edu/lang/) at The New School (https://www.newschool.edu/) bell hooks, Theaster Gates, and Laurie Anderson discuss art in popular culture today. Read the full article on Overland Literary Journal. "The Free Black Women's Library, is an interactive Black Feminist mobile trading library and interactive biblio installation that features a collection of 1000 books written by Black women. The library is committed to centering and celebrating the voices of Black Women in literature. This mobile library pops up monthly in unique and radical spaces throughout Brooklyn, NYC and has also been to Detroit, Chicago, Philadelphia and Baltimore." "Sixteen-year-old Channah took part in a HLF-supported youth heritage project at Camden Arts Centre in London and discovered the confidence to make her own artwork, lead a talk and present an exhibition." "The Archive is a specialised library for Middle Eastern and North African Art Literature, located in Dubai's Safa Park. "A Study Day with Lubaina Himid organised by BAM in collaboration with Iniva. Invited participants included Dorothy Price, Christine Eyene, Jane Beckett, Evan Ifekoya. Stuart Hall Library, Iniva, 20 June 2016." "The Library at ETCA is a center of learning, activity and fun for children and adults in El Transito. It is a happy place - open to all, for reading, after-school activities, games and community support. The need for additional Spanish books is constant as the residents of El Tránsito have very limited resources for studies and research. An ongoing effort remains to locate additional Spanish books and games, children’s art supplies, and study and research materials and textbooks and references." "2016 ABOG Fellow Joseph Cuillier created The Black School, an experimental art school that uses socially engaged art and Black history to educate Black/PoC students and allies in becoming radical agents of social change by combining art making workshops, radical Black political theory, group discussions, and public projects that address community needs. The focus of the Journal of Public Pedagogies is to publish articles that engage in discussion about learning and teaching outside formal educational institutions. These areas include arts, community engagement, social pedagogy, public history, work in and research on public institutions like museums, libraries, neighborhood houses, community centers, practice, research and evaluation in public pedagogies. At our 2015 conference we collected responses to the question what is public pedagogy? This exploration takes us into other questions such as what is learning and what is the relationship of learning to the term pedagogy. 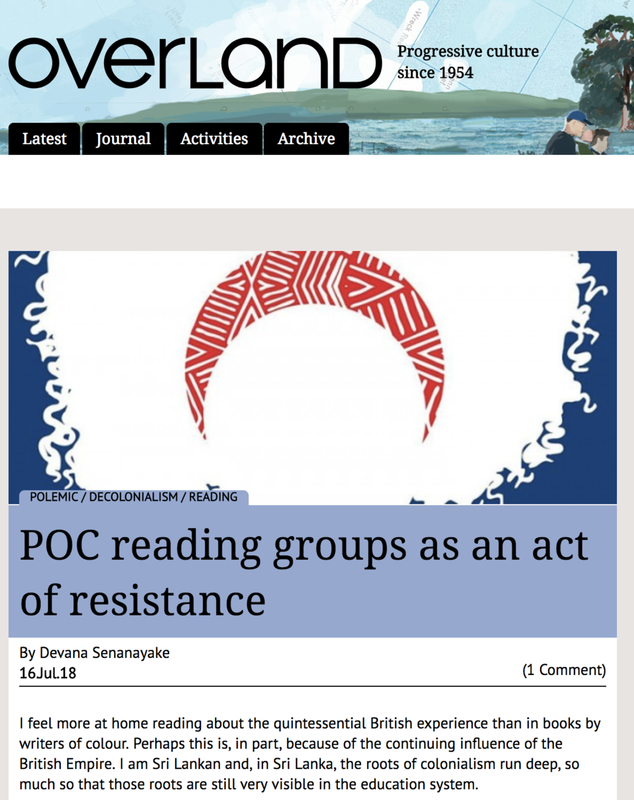 We need to understand the racial politics that inform knowledge production as this goes right to the heart of both what the university is and what racism is.” To decolonise is to imagine that another university is possible. Akwugo Emejulu examines the frameworks of 'white ignorance' that impede the recognition and legitimation of women of color as political agents in the UK and France. Despite their calculated erasure by both policymakers and ostensible 'allies,' women of color are mobilizing in innovative ways to advance their intersectional claims for social justice. This interview was originally published on the Colour Box Studio website in 2013. "Torika Bolatagici talks to Colour Box Studio about becoming an artist and her Community Reading Room installation which is open to the public 1-22 June. I don’t know what happened, but one day in sociology class, something just clicked, and I wrote an essay called “No Justice, No Peace” about the LA Riots. I had been barely passing my other subjects, and when I saw a big “D-“ on my paper, I was devastated and about to quit. Then I found out that a D was a Distinction, and since then I haven’t looked back. I discovered that when I was writing about something I was passionate about, it was easy. I was getting into the writing of bell hooks, Patricia Hill Collins, Angela Davis, Bobbi Sykes and going to feminist conferences with mum where I would attend lectures by writers, poets and activists like Jackie Huggins, Marcia Langton and Lisa Bellear. So I suppose it’s not surprising that my writing and research is focused on gender, race and visual culture."